Welcome to tutorial 20 in this series of tutorials to help you learn TradeStation EasyLanguage programming skills. The idea behind the series is that if you can program with TradeStation EasyLanguage yourself, you will have a skill that will enable you to try out trading ideas without the need to use a professional programmer. As always, the purpose of this tutorial is to demonstrate the programming techniques rather than to create a tradable indicator. This tutorial was created using TradeStation version 8.6. 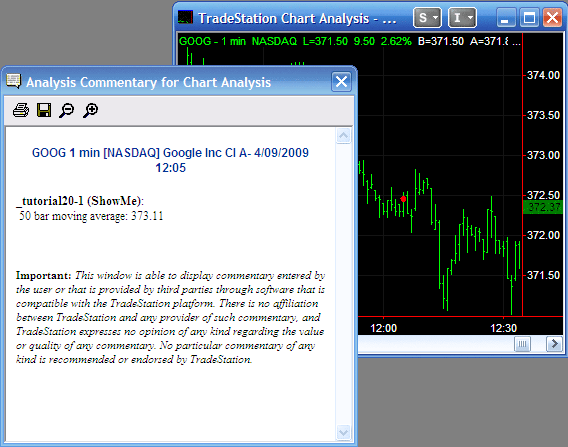 Analysis Commentary is a useful Tradestation feature that enables you to create an EasyLanguage program or part of an EasyLanguage program that only runs when a bar is clicked using the Analysis Commentary pointer. This opens a window which displays the information whose output you have programmed. Its probably easier to demonstrate by example, and so in this tutorial we will first create a very simple commentary program. We will then go on to create something more complicated using Analysis Commentary’s HTML capabilities. Create a new ShowMe study by clicking File – New – Window and when a window appears, selecting the EasyLanguage tab. Click on ShowMe followed by OK. Enter a name for the ShowMe, e.g. _tutorial20-1 and click OK.
Press F3 or click the verify button to verify the code and correct any typos. 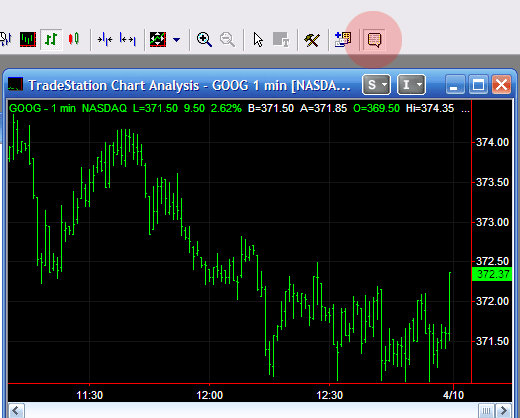 Open a new chart and apply the ShowMe to the chart by clicking Insert – ShowMe. Obviously this is a very simple example. 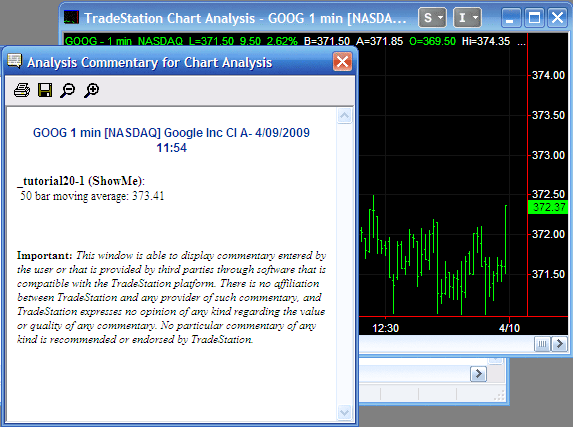 You could add significantly more information into the commentary statement and one of the benefits of using Analysis Commentary is that the calculation included in the Commentary statement is only run when you click the Analysis Commentary button AND click a bar on the chart. If AtCommentBar is included in a program, it evaluates to TRUE for the bar that is clicked with the Analysis Commentary pointer. 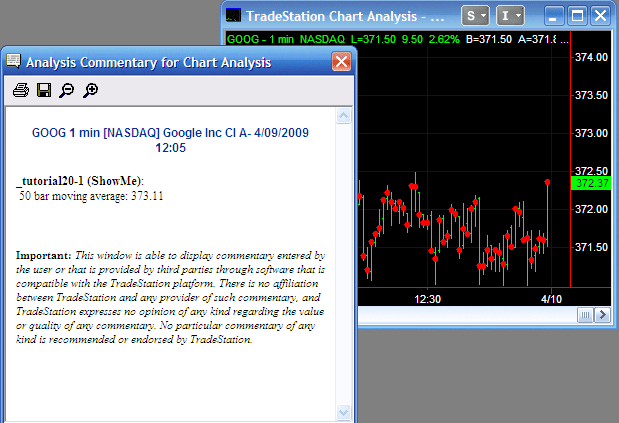 If CommentaryEnabled is used, when a bar is clicked with the Analysis Commentary pointer then CommentaryEnabled evaluates as true for all bars. Verify the program and look at the chart. Notice that the Analysis Commentary window appears as before with information about the bar that was clicked, BUT we now have a plot on every bar. This is because CommentaryEnabled evaluates as TRUE for every bar as soon as we click on a bar using the Analysis Commentary pointer. I have not added comments, in order to save space, but adding comments (i.e information about the program, that doesn’t affect the running of the program) is good practice. In the above program, we have used the C_3WhSolds_3BlkCrows function. 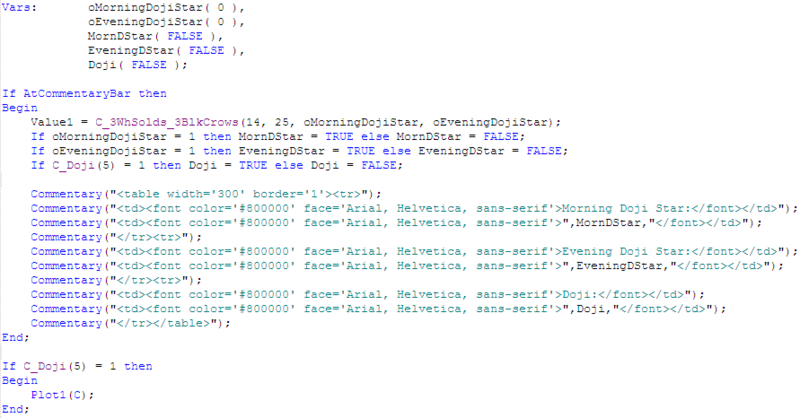 This requires us to create the two variables: oMorningDojiStar and oEveningDojiStar. We are using the AtCommentaryBar syntax, so the items within the “if statement” are only evaluated for the the bar that we click. In both the case of the C_3WhSolds_3BlkCrows function and the C_Doji function I test if they are equal to 1 and, if so, set another variable to TRUE, if not I set it to FALSE. These variables are used in the table. Notice that since the Commentary statement is included within double quotes, I have used single quotes in the HTML. If you are structuring very complex HTML it would make sense to use a program such as Adobe DreamWeaver to create the HTML and then to copy it into TradeStation. 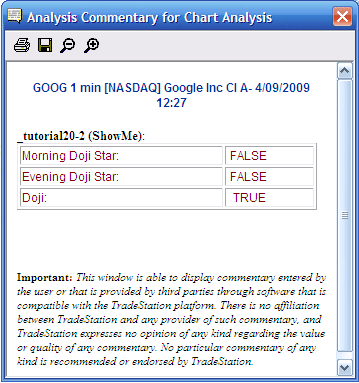 Thia tutorial aims to help in the understanding of the Analysis Commentary windows and some of the possibilities it offers, especially in terms of formatting using HTML.